Now the male person around here thinks that we goats don't need coats but the publicist thinks they are very stylish. She is thinking of making some for us when she gets her sewing machine set up in her new house. She found these directions on the Dairy Goat Journal site and it said she could share them. She thought that you might like to see how to make a goat coat for your goats. This is excerpted from an article by Maxine Kinne. Throughout my years of involvement with goats, I've seen several types of coat designs and found them wanting because they are so complicated and expensive to make. They require trim sewn on all cut edges. Expense is driven up with wide nylon webbing and quick-release buckles or snap rings. These are fine if you want show coats-they can even be embellished with herd names or logos. But for pure utilitarian convenience, polar fleece is my fabric of choice. A single layer has great insulating qualities. The cut edges do not ravel, it is soft and easy on the skin yet wears like iron, and it launders beautifully. It comes in a variety of colors and patterns for flashy goat finery. One 28" to 30" remnant yields two adult mini-goat-size coats. Careful measurements can adjust my pattern to fit any breed or size of goat. Cut the fabric to those measurements. Fold fabric on center back line. Cut a 4" V-shape from center neck to chest front. Measure 4" from center neckline for centerlines of 1" darts. Taper 6"-long darts on both halves. Sew center front chest seam together. Ties are made from salvage edges of polar fleece or 1" bias tape folded and zigzagged together lengthwise. Sew the darts and front seam, then fit the coat inside-out on the goat. Mark tie locations just behind the front legs, in front of the hind legs and about halfway up the goat's side. Sew ties securely to the wrong side. I have learned to leave the ties longer on one side to be able to hide the bows under the coat to thwart the wearer and envious herd mates who might nibble on and untie it. I always used a stanchion for fittings, and the side I was on dictated leaving longer ties on the side furthest from me. Tie them as securely as you would a child's shoelaces. I tie a large bow, and then tie the bow together. During the final fitting, make sure that the rear ties are not tight enough to interfere with the udder or milk vein in late gestation and lactation. Do not tie the coat on too snuggly. Without ties or a belly band sewn on underneath, the coat will be removed or wadded into an unsightly mess under the goat. Disheveled goats are unhappy and quite unfashionable. Even with ties, belts and associated security devices, the creative caprine finds ample opportunities to twist and mangle the attire into a mere shadow of its former sartorial splendor. Here's how to avoid this embarrassment. Hopefully. To retain additional body heat, add a 10"-wide belt of the same fabric instead of one set of ties. Cut the band 8" to 12" wide by 14" to 16" long (for Pygmies). Sew it between the tie marks on the side furthest from where you will stand to tie it on. To tailor the belt to the paunch, sew a large dart at the edges closest to the chest and the udder. Add ties to the two corners of the band to correspond with the ties on the other side of the coat. The bellyband is a good place to insert a heating pad. If it is necessary to use one, constantly monitor the goat due to the possibility of electrocution (biting the electrical cord) and to make sure the heating pad stays in place. 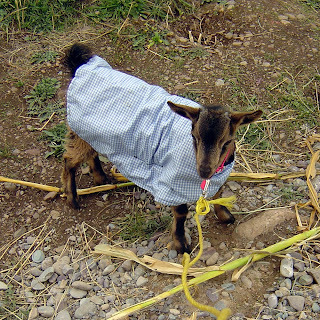 If your goat has real trouble keeping the coat on, it can be stabilized by sewing on a 12" tie at the center back at the neck to tie to a collar. A coat with a belt is better for bucks and wethers than one with ties. The rear tie can rub on and irritate the penile sheath. Fit the coat on the male and mark a circle several inches in diameter around the end of his sheath. Remove the coat and cut this fabric away. This will let him urinate without completely soaking himself. She is the only goat on the Farm to ever have a goat coat.